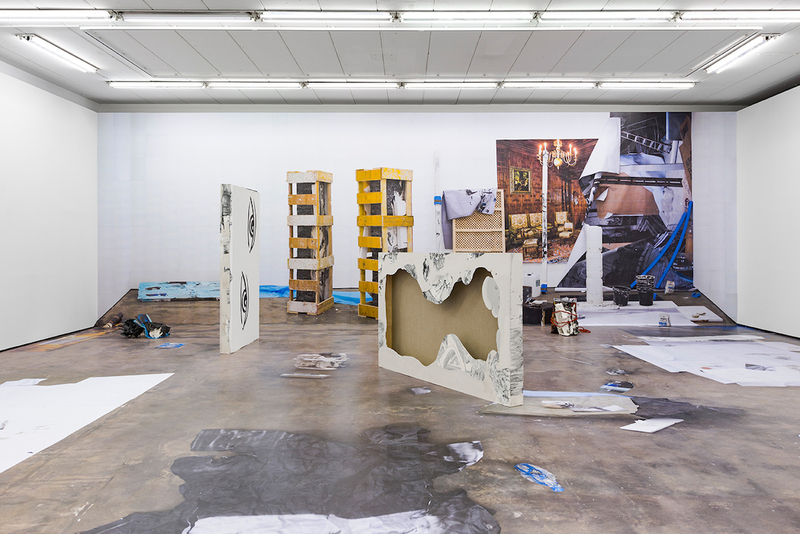 Mark Mann’s ‘O Uncolored People’ at Owen James Gallery, installation view. Image courtesy of Owen James Gallery. “O Uncolored People” — now on view at Owen James Gallery — is a group of small-scale works by Mark Mann that together spotlight and critique a now hotly contested vision of America. Paintings in the show are based on vintage promotional postcards from American resorts. Sculptures make use of reclaimed tin cans once used to hold imported foods. 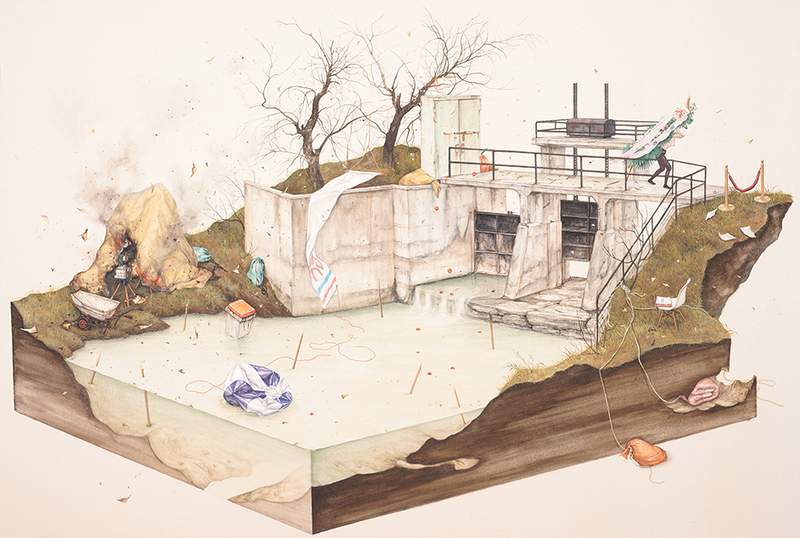 The show is both a reminiscence and a rumination as Mann tackles the larger themes of pain, class and international relations with a dark sense of humor that brings many of white, upper-class America’s hypocrisies to light. 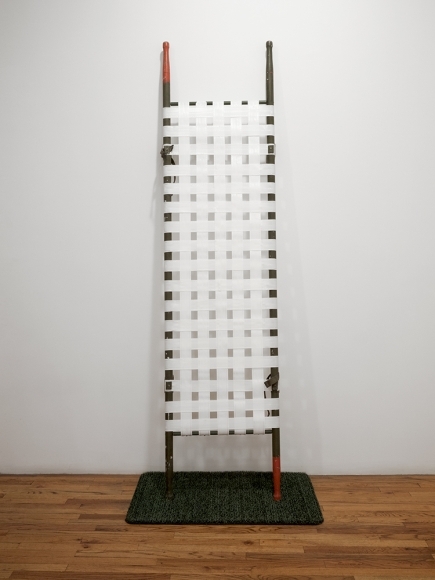 Mark Mann, Pearl Heart, 2016, Military Stretcher with Nylon, 96 x 22 inches. 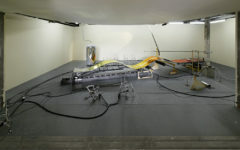 Image courtesy of Owen James Gallery. Pearl Heart (2016) leans against a wall by the gallery’s entrance. It is a military stretcher made with white, nylon straps originally used in beach and lounge chairs. Two of the four black handles have been painted red, resembling bloodstains. Visually, the object evokes war and the wounded. The title takes its name from the notorious female bandit, Pearl Hart, who famously robbed an Arizona stagecoach around the turn of the century. Perhaps pertinent to the show, Hart was later arrested for stealing canned goods in Kansas City. Title and object may also bring Pearl Harbor to mind. 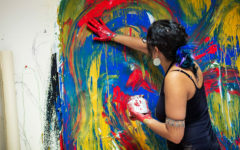 Introducing themes of travel, history, exploitation and physical pain, Pearl Heart visually and conceptually sets the show in motion. Mark Mann, Irish Twins, 2016, acrylic on two wood panels, 10 x 20 inches overall. “Irish Twins” (2016), consisting of two small paintings that work in tandem, visually picks up on the white crosshatching of the stretcher. Here, the pattern makes up the backs of lawn chairs and the structure of suburban, white picket fencing. The scene, featuring two seated, sunburned figures, is divided down the center through a third lawn chair situated between them. European immigration to the U.S. is touched upon. Sunburned skin, once the mark of lowly, manual labor, has become an ironic, voluntarily painful marker of leisure and financial comfort. As the fire of the sacred heart symbolizes both painful sacrifice and the transformative power of divine love, this sun-scorched skin symbolizes status and the transformative power of money. Mark Mann, Driver, 2016, acrylic on panel, 11 x 11 inches. The crosshatching again appears on the swim trunks of the figure in “Diver” (2016). 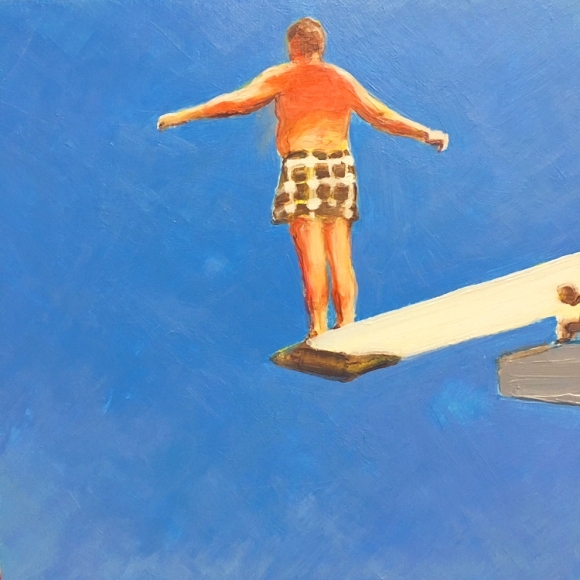 Sunburned, apparently well-fed, with arms outstretched, a man stands at the end of a diving board surrounded by an expanse of blue. The blue may be read as water or sky depending on how you look at it. Within the larger context of the show, the swimsuit pattern resembles an imprint that might appear on the skin after sitting in a lounge or beach chair for some time — a self-imposed hot seat. Meant as a respite from work, under the heat of the sun, the resort vacation may be turned into yet another stressful situation. At least the resort offers a safe ledge from which to jump. “O.U.P – Joy” (2015) appears to be a sarcastic nod to Paul Gaughin’s exotic depictions of Tahitian women. Leisurely posed by the side of the pool, Joy wears a lei around her neck and a multicolored swimsuit. 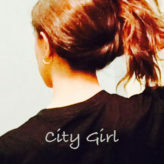 Her dark hair is draped over one shoulder. Joy, however, is just as sunburned as others. Her particular self-harming, bodily form of exoticism seems to hint at the ills and ironies of Western colonialism and exploitation. 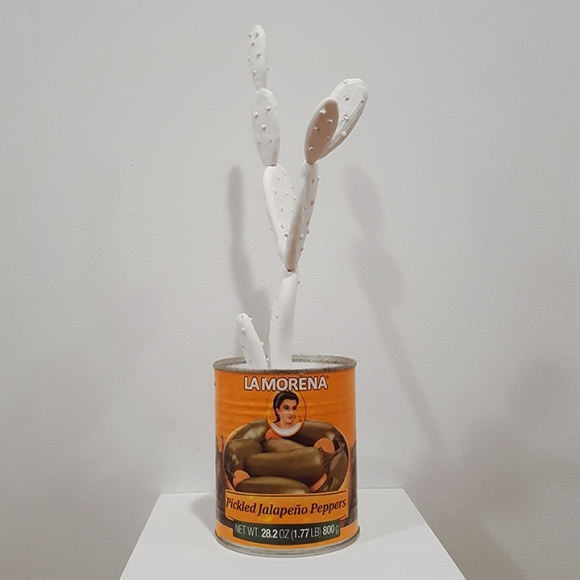 Mark Mann, La Morena Cactus (Brown Hair), 2017, plaster with metal can, 12 x 6 x 6 inches, Edition of 4. La Morena Cactus (Brown Hair) (2017) features the only person of color in the show. On the label of a can once used to store pickled jalapeño peppers, she is defined by her dark hair. Her skin is marked with tears. In the can now sits a cactus of white plaster, a sort of petrified plant incapable of growth. For this piece, as well as the title of the show, Mann has drawn on work by Ed Ruscha entitled “Colored People” (1972). This is a book filled with photographs of cacti against white backgrounds that is intended to humorously address the very serious cultural divisions within the United States at the time. Mann’s work for “O Uncolored People” similarly grapples with our present-day issues of national identity and international relationships. I think it would be remiss of me to not mention our own orange hued president at this time, for the vintage materials upon which Mann has based his work harken back to the very time and image of America he seeks to recapture and himself embody — white, wealthy and merely superficially interested in other countries and cultures in so far as they can feed his own self-interest. Mann’s work, however, provokes us to make new meaning out of these old images and piece together our own versions and visions of American identity.